Villas Nizuc, Villa 26 is a beautifully decorated, well maintained, three bedroom townhouse style condominium, located on the beach in the Hotel Zone of Cancun. The Cancun Hotel Zone is considered Level 2 SAFE for visitors by the US State Department, on par with England and Spain. No travel restrictions exist. In 2014 we did a $320,000 total renovation of the villa.Virtually everything in the villa is new, inside the walls & in the living areas. Each bedroom has it's own completely private bathroom with double sinks & shower included, a hotel type safe and a balcony with beautiful views of the beach & ocean & /or the lagoon.There is also a large, fully equipped kitchen,dining room & living room at ground level. We get most American TV channels, including the major networks & we have CD & DVD players & a high end stereo system. There are over 3000 square feet of living space for your enjoyment. There is WiFi throughout the villa The villa is right on the main Cancun Hotel Zone beach with beautiful views of the Caribbean from virtually everywhere in & outside of the villa & from our private patio & balconies.We are located between the Westin Regina and Sun Palace Hotels at Km.20 on Blvd. Kukulcan, the main & only Hotel Zone road. Our own maid of 20 plus years comes everyday but Sunday to clean, do laundry and keep the villa in good order. She can also arrange to resolve any problems in the villa. Cooking can be arranged, but there is a very reasonable additional charge.THE MAXIMUM OCCUPANCY OF THE VILLA IS EIGHT (8) PEOPLE REGARDLESS OF AGE. If renters might have visitors who are not staying at the villa, please discuss the villas' "visitors" policy with the owner. We provide all towels , including beach towels, linens, hand soap, & sand chairs & umbrellas for the beach. The only things guests need to bring are their own shampoo & hair dryers & any personal items like medication, cell phones, etc. The villas are a gated community and has 24/7 security, a handyman, gardeners, pool care, beach cleaning & the grounds are beautifully maintained. We are a short walk down the beach from great snorkeling & are near all kinds of beachfront activities like parasailing, jet skiing, etc. Since we are in the Hotel Zone we are near hundreds of restaurants, shopping malls & marinas, and two new USA style supermarkets, yet the villas are very private & quiet. Parking is next to the villa if you rent a car, and taxi & bus service are all just outside the villa entrance. If you rent the owner will provide you with lots of useful information to make your Cancun vacation a great experience. Our villa is ideal for families, couples or friends who want to travel and stay together. The villas are a low key, relaxing type accommodation and are NOT suitable for people who want to party or drink heavily. Since the cost is for the whole villa, which can very comfortably accommodate eight people, it is far less expensive than staying in a hotel or all inclusive resort. Each of our three bedrooms is physically separate from the others and has it's own en suite bathroom, so there is plenty of privacy when you want it. Also, since the main living area & patio are at ground level there are no elevators to take & no lobbies to pass through. It is a 30 second walk to the 2 pools, one of which is for young children, and a one minute walk to the beach across our beautifully landscaped, palm tree studded grounds. We get many repeat renters and if you rent my villa once, it is highly likely you will want to rent it again. I am a clinical psychologist in private practice in the USA. My wife & I have 2 children & 2 grandchildren, who often come to Cancun with us. 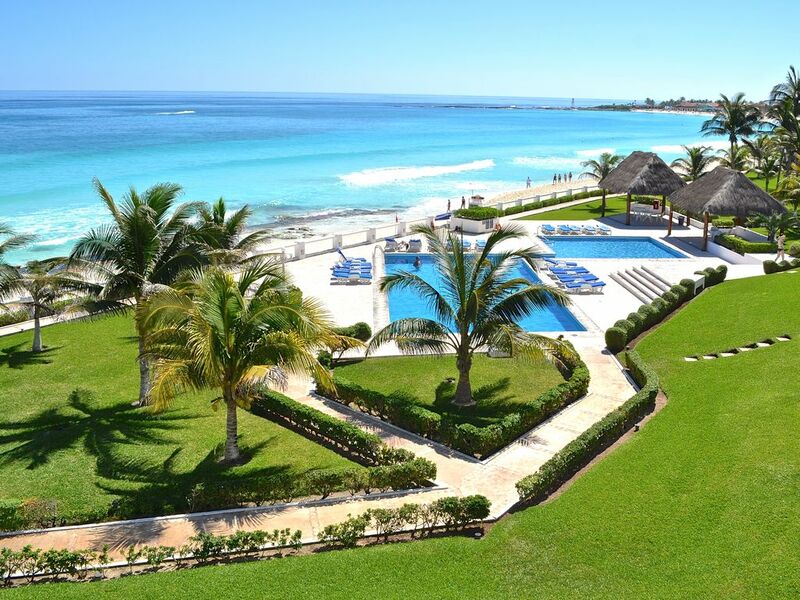 We all love being at our villa, Cancun & the surrounding area & islands. Villas Nizuc is the only low-rise townhouse condo in the Hotel Zone of Cancun. It is right on the beach & we love walking out our living room directly to the pool & beach-no elevators, no lobbies. Our new totally renovated, luxurious villa feels like living in your home without any of the work. Our wonderful maid of 20 plus years takes very good care of the villa & all our guests. All the bathrooms are brand new (2014), very spacious and beautiful. We are about 150 feet from beach & the beautiful Caribbean Sea. You can see the beach from virtually everywhere IN & out of my villa. Every space has fast cooling, quiet split type air conditioners that will keep you cool in the hottest weather. All linens are provided & changed regularly. We have a large modern washer. We have a large modern dryer. Numbered parking is on site & right next to the villa. All types of towels are provided, including beach towels. My maid will wash all your dishes & put them away if you leave them by the kitchen sink. Large side by side refrigerator with ice maker & bottled water supply accessed through the freezer door. New gas oven & 6 burner cooktop. 12 cup drip through filter coffee maker & we provide filters or you can use mesh filter also available. All sorts of spices, condiments, etc. We provide all dishes, silverware, glasses & cooking utensils you will need. If there is anything you need & don’t find, ask my maid & she will find it for you or buy anything reasonable for you. We have a fully equipped kitchen with a side by side refrigerator with ice maker and water dispenser in the door, a large gas oven & 6 burner cooktop, microwave, large toaster oven & all utensils. 2 TVs, one in master bedroom & one in the living room. The living room & master bedroom can watch different channels at the same time. Many USA channels, including the major networks. We have a small collection of books in the villa. We have many games, cards, poker chips for your use. You can play your own music by connecting with our receiver by Bluetooth or bring your the aux cables you use to connect your device in your car. We also have a 6 CD player if you bring your own CDs. We have beach toys & some games for children. We have a large collection of wonderful DVD movies you watch and. of course, you can bring your own to watch as well. Beautifully landscaped & maintained lawns & palm tree studded grounds. Every bedroom has it's own balcony. None - the 1 is an error. We have a large patio with lounge chairs and a table and chairs for outdoor dining. You will love it. We do NOT provide snorkeling or water sports gear. There are three 18 hole golf courses very near our villa. The villas does NOT have it's own golf course. We have a lifeguard overseeing the pool & beach. Villas Nizuc is right on the beach in the HOTEL ZONE of Cancun between the Westin Regina & Sun Palace Hotels on Blvd. Kukulcan at Km. 20. It is close to over 100 restaurants, major shopping malls, marinas & all kinds of water sports & boating activities. There are also 3 golf courses within a few minutes of the villa and you can rent tennis courts at nearby hotels.